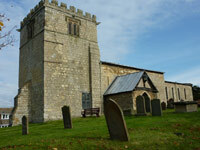 The church is open each Saturday and Sunday between 10.00 am and 6.00 pm from April until the end of September. Although it is locked at all other times, a key is available from either The Goodmanham Arms, or alternatively from Mrs Christine Sawyer at Rectory Farm. From November 2017 services will be held only on the fourth Sunday of the month. All Hallows Church was constructed in 1130 on the site of the demolished pagan temple with a simple nave and chancel and it is a fine example of an early Norman period church. The tower is thought to have been built in 1180 and in 1200 the nave was enlarged when the north aisle was added. The 5ft high font is early 16th century with rich carvings on its eight-sided bowl and stem. In 1850 an earlier font, possibly dating from the ninth century, was found in a farmyard where it had been used as a drinking trough, and it was returned to the church. The church was restored by the architect Temple Moore in 1900, and in 1927 there was a pilgrimage and a service held in the churchyard to mark 1300 years of Christianity in the North of England. The older stained glass windows reflect the church’s long and interesting history and include images of King Edwin, Ethelburga and Coifi. The modern Millennium window vibrantly illustrates Goodmanham‘s spiritual and pastoral heritage.